Basing off of what I know and the changelog. The Texture Effector works when paired with other parts. Could as well replace the searchlight pretty well. A specific parameter sets the following values. Drawing of two type-specific parameters are set the following values. 3-specific parameter sets the sprite ID. If the drawing type (solid) will be ignored-color fill. You input the Sprite you want to use for the texture. The list is accessible from the Misc window that can be shown when pressing the "misc" button on the Toolbar. Four parameters that are specific to set the texture type. 4-point texture is in the drawing area to specify the four points in the 1 ~ 4 (P1 ~ P4) spare parts. Spare parts the texture of parts to draw a rectangle area that is specified in the spare parts. The target pair parts can specify up to four of from 1 to 4, and judgment will be applied only contact a spare parts. This sets up how the texture should be displayed. 1-8 = The textures are placed separately on top of each paired part, size will also vary, depending on the size of the parts themself. That can be modified using Ex. Params 14 and 15. This needs further insight. 5-specific parameter sets the following values. This adds attributes on the emitted texture, much like any other effector. Type-specific parameters are drawing 6-8 if (-1), set the foreground color in the HSL color fill. If the drawing type (sprite) is ignored sprite. Value will automatically roll (Hue) 4096 = 360 degrees, if you specify more than one 4096 H.
(Saturation) is the saturation is reduced by decreasing the value 0 as a reference, you will monochrome -4096 S.
Bright and darker, smaller (Lightness) is a higher value relative to the 0 L.
Hue, Saturation and Brightness can be used when you use a solid colour as a Draw Option. 9 unique blend mode of the parameter is set the following values. Similar to how you would set up a background. Blend of 10 alpha-specific parameters are set the following values. Similar to Blend Mode, however this applies for the Alpha layer. 11-specific parameter sets the blend ratio. When the drawing is treated as a blended rate of 100% 0% 0, 256 to 100%, even if you set more than 256. Changes the blending ratio of the texture. 12-specific parameter sets the duration of the effect object that has been generated. If (& 1) is specified blend ratio will now automatically decay decay automatic 5-specific parameters. If this Param has a value, The effector will leave a "trail". 13-specific parameter sets the speed factor. Operating speed factor will affect the basic rate for each pattern. This affects the speed of the emitted effector. It is dependent on the move action and the Effect Scroll The effector was set on. 14 and 15 are specific parameters to set the magnification factor. 4-point texture will be applied only 14 specific parameters. Spare parts and 15 texture-specific parameter 14 will be applied. This changes the overall size of the effector. If Ex. 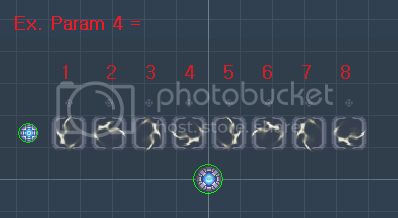 Param 4 has a value other than 0, This changes into X Size. Please note that If you do not give this a value, the effector will not show up. Works when Ex. Param 4 is set to other than 0. In my personal opinion, It is kinda much of a hassle, but if used well, You'd be even capable of making Pseudo-3D walls for levels or something. I will try to make more Screencaps displaying how it works. If you find something hard to understand, you may ask a question or something. Last edited by Garoslaw on Tue Jun 18, 2013 5:35 pm, edited 2 times in total. Updated, with the missing Ex. Param 3 info.